For my initial paper, Master suggested that I research the history of the Roman Catholic Festival of Corpus Christi. He suggested that the Council of Trent may prove to be helpful in my dating efforts. Being the third under the Sovereign Pontiff, Julius III., celebrated on the eleventh day of October, MDLI." Wherefore, there is no room left for doubt, that all the faithful of Christ may, according to the custom ever received in the Catholic Church, render in veneration the worship of latria, which is due to the true God, to this most holy sacrament. ​For not therefore is it the less to be adored on this account, that it was instituted by Christ, the Lord, in order to be received: for we believe that same God to be present therein, of whom the eternal Father, when introducing him into the world, says; And let all the angels of God adore him; whom the Magi falling down, adored; who... as the Scripture testifies, was adored by the apostles in Galilee. The holy Synod declares, moreover, that very piously and religiously was this custom introduced into the Church, that this sublime and venerable sacrament be, with special veneration and solemnity, celebrated, every year, on a certain day, and that a festival; and that it be borne reverently and with honour in processions through the streets, and public places. For it is most just that there be certain appointed holy days, whereon all Christians may, with a special and unusual demonstration, testify that their minds are grateful and thankful to their common Lord and Redeemer for so ineffable and truly divine a benefit, whereby the victory and triumph of His death are represented. And so indeed did it behove victorious truth to celebrate a triumph over falsehood and heresy, that thus her adversaries, at the sight of so much splendour, and in the midst of so great joy of the universal Church, may either pine away weakened and broken; or, touched with shame and confounded, at length repent." The date for the 19th Session is May 14, 1562. Being the third under the Sovereign Pontiff, Pius IV., celebrated on the fourteenth day of May, MDLXII. The sacred and holy, ocecumenical and general Synod of Trent,--lawfully assembled in the Holy Ghost, the Same Legatesof the Apostolic See presiding therein,--has, for cerain just and good reasons, thought fit to prorogue, and doth hereby prorogue, to the Thursday after the approaching solemnity of Corpus Christi, which will be the day before the nones of June, those decrees which were to have been on this day ordained and sanctioned in the present Session..."
As clerkes in corpus-christi feste singen & reden. All þe artificers belonging to Corpus Xti Plaie. This samin tyme..Completit wes..Of Corpus-cristie the solempnitie. Thys deuyll and I were of olde acqueyntaunce For oft in the play of corpus Cristi He hath played the deuyll at Couentry. 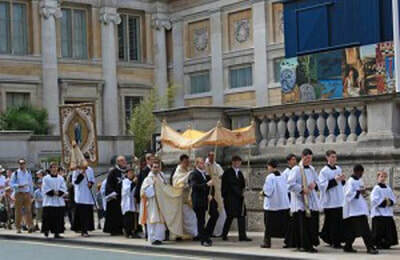 ​The pageants that were play'd therein, upon Corpus-Christi day. It seems as though the English has celebrated Corpus Christi since at least 1377, almost 200 years before the Council of Trent suggested that it be introduced throughout Christendom. However, through previous research we know that before the 16th century (and the introduction of Latin spellings), "Christ" was written as "Crist". Therefore, the dates of 1377 and 1415 are incorrect based on their spelling alone, and not to any reference to the Council of Trent. We are left with three examples from 1476, 1535 and 1544 that occur previous to the 13th session of the Council of Trent in 1551. 2. or the dates the Council of Trent are incorrect. While we are tempted to place the dates later, that is, after the Council of Trent, we are uncertain that the dates of the Council are correct. In the fourth session, in April, "MDXLVI" or 1546 we have the decree of what books of the Bible are canon. At the Jerusalem Council of 1672, the Orthodox Church comment on what books are Biblical canon. It seems odd, although not impossible, that the Greek Church waited for over a century to respond to the developments in the west to decide or state what was canon. The Orthodox Council commits much effort to refuting Calvin's theology (lived allegedly from 1509 to 1564) entitled "Against the Calvinists". It seems more likely that the documents from the "Council of Trent" began to circulate in the 17th century and Calvin lived much later, prompting a current, and not delayed by more than a century, response from the Eastern Church. 1377 corpus-christi feste singen & reden. c1415 On Corpus Christi even. 1476 All þe artificers belonging to Corpus Xti Plaie. 1535 Of Corpus-cristie the solempnitie. After the introduction of the festival and before the influence of the Latin spelling. After the influence of the Latin spelling. ​The letter "H" is present. The letter "H" is present. The hopes of the Fathers' of Trent remain unfulfilled as the heretics have neither pined away weakened and broken nor have they repented of their manifest heresies "...at the sight of so much splendour, and in the midst of so great joy of the universal Church..."